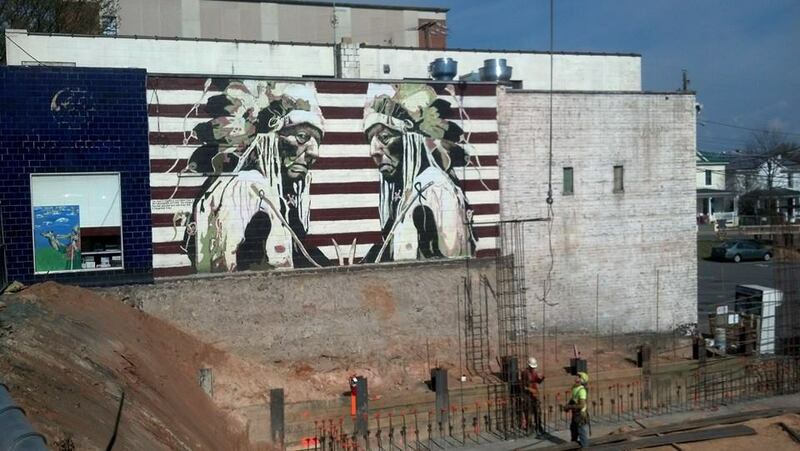 The iconic mural of two Indian chiefs that graces the side wall of the Afghan Grand Market on West Main Street will remain as a new Marriott Residence Inn goes up beside it, but it will be largely obscured from view, say City officials. The mural was commissioned by former Random Row Books in 2011 and painted by a group of Tandem Friends School students, a response to the nearby Lewis, Clark, and Sacagawea statue. More importantly, the late developer Gabe Silverman, who died last November and owned the Afghan Grand Market building under his Main Street Associates, LLC, allowed the mural to be painted on his property. “There will be a few feet between the hotel wall and the Afghani Market wall. You will still be able to see it, but barely,” says Mary Joy Scala, the City’s Preservation and Design Planner. Scala believes the Indian mural is the best mural in town, and that it also serves as a reminder of Silverman’s imprint on the community.